This species is listed in CITES Appendix I. It is legally protected in Viet Nam (Appendix 1B of Decree 32, 2006), though enforcement against forest encroachment and poaching is not adequate in most cases. 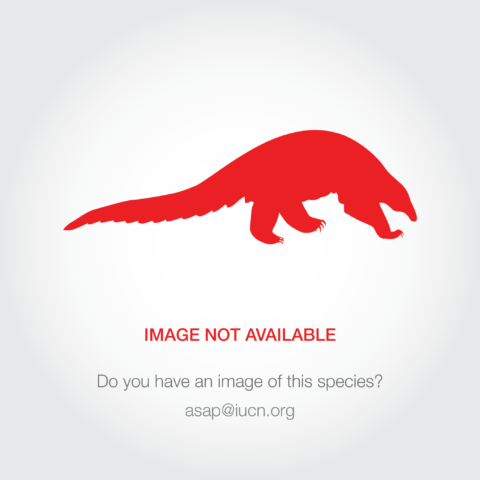 In China it is protected by wildlife protection law (issued in 1989) (L. Yongcheng pers. comm.). It occurs in a mixture of protected areas and national parks throughout its range. In Viet Nam it is present in Pu Huong Nature Reserve and Ben En National Park. In Lao PDR, it is present in Nam Et and Phou Loey, Nam Xam, Phou Khao Khoay, Phou Panang, Nam Kading, and Phou Dene Din National Protected Areas, and also in Santong Training and Model Forest. In China, it was previously reported in Xishuangbanna National Nature Reserve, but only in the two sections bordering Lao PDR. Recommended conservation measures include prevention of hunting and wildlife trade; minimization of habitat disturbance; and research and field surveys throughout the range, specifically tape recordings, genetic analysis and photographic recordings to help better define the distribution area of the taxon relative to N. siki. This is among the most common species of crested gibbon (genus Nomascus) maintained in zoos (Varsik 2000; Gibbon Network 2006; Moisson and Baudier 2005). This species occurs in Viet Nam, Lao PDR and China. In Viet Nam, it occurs west and south of the Black River; it has been extirpated from several areas from which it was previously recorded and is now only known from a few localities in the north-west and north-central parts of this country (Geissmann et al. 2000). In Lao PDR, it occurs in the northern parts, east of the Mekong River, except for a small area in northwestern Lao PDR on the east bank of the Mekong at about 20°17'-20°25'N, where it was replaced by N. concolor (Geissmann et al. 2000). In the 1980s, a very small population still occurred in Xishuangbanna in southernmost Yunnan province, China, just across the border from Viet Nam (Hu et al. 1989, 1990), but the species might no longer survive there (W. Bleisch pers. comm. 2006). It was formerly sympatric with N. concolor in Luchin, Yunnan (China), and possibly also in the Ma River region in Viet Nam (Dao Van Tien 1983; Ma and Wang 1988; Geissmann et al. 2000). There may be an apparent overlap or interdigitation between the ranges of N. leucogenys and N. siki between about 19 and 20°N (Groves 2001). There have been no records of this species from China since 1990 despite survey work, and it might now be extinct in that country (W. Bleisch pers. comm. 2006). In Lao PDR, population numbers of this species are highest due to the larger areas of remaining natural habitat, though increased hunting since 1990 to support the wildlife trade threatens these animals. Relative to N. siki and N. gabriellae, densities and numbers of this species in equivalent forest blocks are significantly lower due to higher exploitation. Forest fragmentation is also much higher in the range of N. leucogenys than in the ranges of the other two gibbon species (Duckworth et al. 1999). 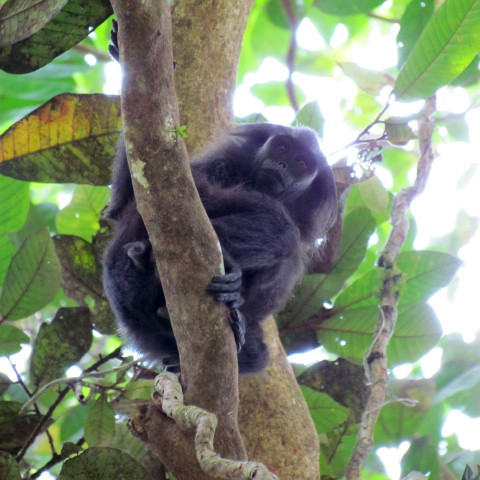 In Viet Nam, the forest habitat for this species is particularly fragmented, and the data from two provinces (Lai Chau and Son La) suggest that gibbons here cannot be sustained on the remaining forest patches (Geissmann et al. 2000). In Pu Huong Nature Reserve, the number of groups remaining is less than 10, while in Pu Hoat Nature Reserve fewer than three groups survive (Nguyen Man Ha et al. 2005). In a status survey report, Geissmann et al. (2003) recorded 27 sites at which this species should have occurred, but it was only confirmed surviving at four, and may survive in a further three. 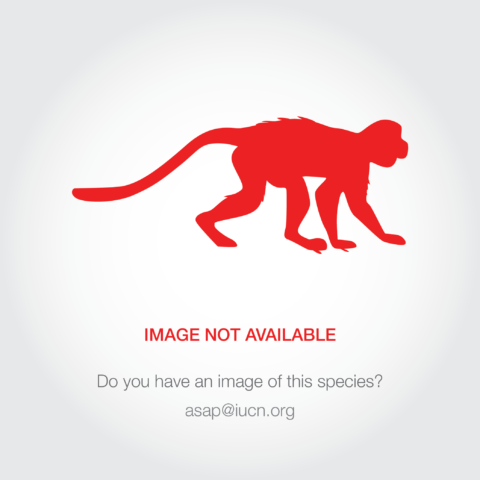 Even protected areas that are known to have suitable remaining habitat, such as Cuc Phuong National Park, no longer hold any surviving gibbon populations (Geissmann et al. 2000). Nomascus leucogenys has suffered from deforestation through agricultural encroachment into mountainous areas and fuel-wood and timber extraction from remaining forests, especially in China and Viet Nam. Hunting for food, traditional "medicines", and their cultural value is a major threat across the range, and is likely to have been the primary cause for the decline of the species in all three countries, including the presumed extinction of this species in China (Duckworth et al. 1999; Geissmann et al. 2000).